Got this [right] from the TT-France mailing list. This would be the full image that the cropped france image comes from. The two Location Finders point to the area of the horns (rather head/body) of Taurus - between Lamba (35 tauri) and Mu (47 tauri) Tauri for the location of Planet X. Yet according to the French Photo taken last Friday April 4th, Stephane says it is next to Taurus 83. 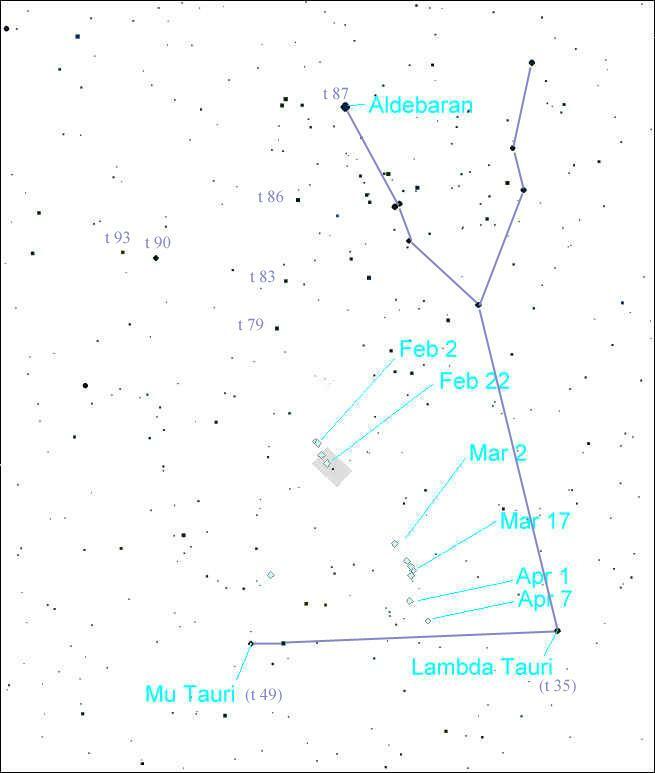 Taurus 83 [chart below] is much nearer to Aldebaran (87 tauri) and not so far as the Horns (body). My son and I went looking for Planet X on three different occasions using plain binoculars, on Monday, Wednesday and I think Friday of last week. On the Friday we drove away from the lights of the city - north Canberra - and parked on a dirt road with few cars passing us. 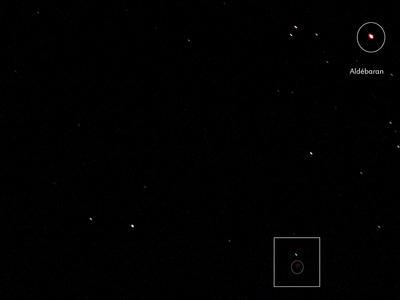 Sighting from Orion towards Taurus, we picked out the bright star of Aldebaran. Then first me using the binoculars, I tried to scan from Aldebaran and the V-shaped cluster of stars pointing towards the Head (rather, the beginning of the horns) f Taurus across the sky towards the location of Planet X. I found a dull pulsing reddish object specifically in a straight line from Aldebaran (tauri 87) are three stars (tauri 86, 83 and 79) then vertically up from the middle star (tauri 83), I saw two others (tauri 90 and 93). The dull reddish pulsing object was between taruri 83 and 90, clearly visible through X10 binoculars.